“Electric Drive” …. 5 Day Hybrid and EV Training on the Road. Our Most extensive training we do on the road. Cost: $4,000. Includes hotel (5 nights) all meals, workbook, HEV 101, EV 101 and OEM recorded webinars, our 330 page “Hybrid and EV Technology Guide” in Color, the ACDC 90 Page L3 Prep Guide, a 4 gig jump drive and ACDC hospitality. You can also add High Voltage Safety Gloves, Meters, Insulated Tools, Insulation testers and more. 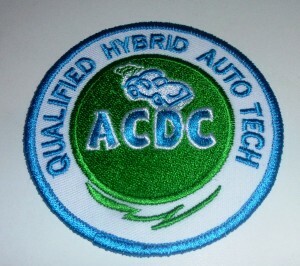 Call the ACDC office at 508 826 4546 for details and pricing on more products you will need to fix HEV, EV and PHEV. 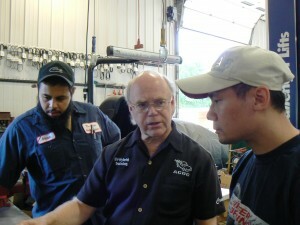 This ACDC class is based on today’s technicians, teachers and others that need relevant training. Become an ACDC Qualified Tech after this class. This class is based on today’s technicians and what they are missing in their training. Hybrids and EVs share a lot of the same components. Travel Day is getting to your Hotel and getting ready for class in the morning. Welcome party at 9pm at the hotel. Day 1 8:30 –5pm Meet at the training center for class room and hands on work. We will cover “What Makes a Hybrid different from a conventional car? An Overview. Safety, Service, Equipment needed and Maintenance Issues”. Anyone with limited electrical knowledge will be given a webinar to watch after class that night so that you can follow along. Day 2 8:30 to 5 “HV Battery Systems.. NiMH and Li-ion. DC-DC Converter operations”. This day is spent studying High Voltage systems and making sure you are safe and also learn how the HV system is designed. HV batteries will be removed from hybrids and taken apart. You will know the construction and function of the battery systems, plus tech tips. We will explain how a DC-DC converter works and how to test it. Day 3 8:30 to 5 “3 Phase Motors. Motor / Generator Controls, the Inverter. ” Day 3 is all about motors and how they are driven. This is how EV are driven, so you will see the future. You will be driving and scanning hybrid and EV cars on the road. Day 4 8:30 to 5 “High Voltage Air Conditioning systems, Heating, Other cooling systems. Nissan LEAF, Bolt and Volt explained, along with EVSE and DC fast charging”. Day 5 8:30 to 3 Regenerative Braking, scope analysis, and a good wrap up session. ACDC has had this program since 2006. That is when the market place asked for one.